Only about a fifth of India’s roughly 1.2 billion people are online, according to a recent Pew Research Center report, and the world’s biggest technology companies are clamoring for this large, untapped user base. Facebook recently tried (and failed) to implement its “Free Basics” internet program, and Google is also vying for the vast Indian internet market. India lags behind other emerging nations in internet access and smartphone ownership. Across the 21 emerging and developing nations surveyed in 2015 (including India), a median of 54% have internet access and 37% own smartphones. 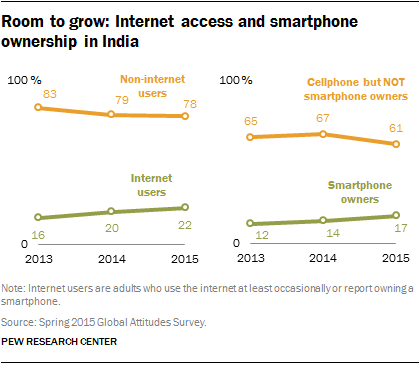 In India, however, only 22% have internet access and only 17% have a smartphone. While the share of Indians with internet access has grown by only 6 percentage points since 2013, those who are online are increasingly likely to use the internet frequently. In 2015, 42% of Indian internet users accessed the web several times a day, compared with just 31% in 2014. Like most of the 40 countries surveyed in 2015, there are big demographic differences in internet access. Younger, more-educated and higher-income Indians are more likely to use the web than older, less-educated and lower-income Indians (relative to the median household income within India). Men are also more likely to have access than women, as are Indians residing in the wealthier North and West regions of India where major cities like Delhi and Mumbai are located compared with the less prosperous South and East. Overall, these patterns hold true among India’s smartphone users as well. There has not been any growth in cellphone ownership and minimal increases in smartphone ownership over the past two years. For many Indians, smartphones are still too expensive, an issue that some technology companies are trying to address, as evidenced by the recent buzz about a $4 smartphone launched in February this year. Meanwhile, the share of Indian internet users who use social media sites such as Facebook and Twitter has increased since 2013, when only about half were using these platforms. Now, a majority of Indian internet users (62%) are social networkers. Online Indian men and younger internet users are more likely to interact on social media sites than online Indian women or older internet users. More broadly, in a 2014 survey we asked online Indians what types of activities they use the internet for. Majorities of internet users said they had used the web to stay in touch with family and friends and to search and apply for jobs in the past 12 months. At the time, fewer than a quarter of online Indians said they were engaging in commerce or taking a class, but roughly a third or more were getting information about health, government services or politics online. Indians don’t necessarily see the increasing influence of the internet in India as a good thing for the country. In a 2014 survey, only 31% of Indians said that the increasing use of the internet has had a good influence on politics, 32% said it was good for personal relationships and 37% said it was good for morality. Views of the internet’s influence on education were more positive, though: 57% of Indians say it has been good for education in their country.